At Chime Lodge, we began the season with doubts. Spring, for example, had been quite dry and we knew that a hot summer could mean low and, perhaps, unfishable rivers by March. But in the end, summer weather was perfect and left us with enough water for good fishing from start to finish. 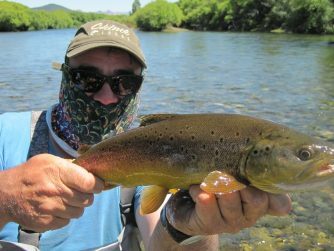 On the lower Chimehuin River guests landed healthy and hard-fighting browns and rainbows. It also produced our biggest fish of the year, a supersized 27-inch rainbow. 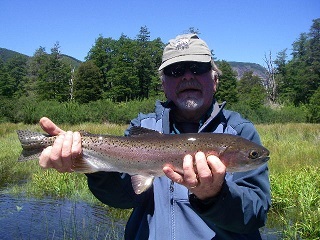 During our days on the water, some sessions produced one fish after another—all very nice trout! And our regional lakes (Huechulafquen, Paimun, and Epulafquen) provided great alternatives when the river turned slow. Stillwater fish included beautiful browns, rainbows, and brook trout, many of them between 20 and 24 inches. Join us next year for more exciting fishing action at Chime. You’ll be happy you did! Weather has been windy and cloudy but the fishing stayed good. 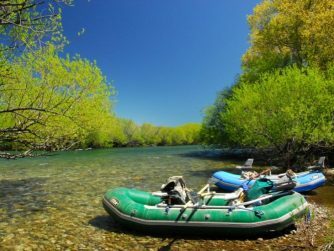 One of the highlights of the last peoriod was the camping we did during the last 3 days in a raft with 2 clients. The first day we did the lower section of the Chimehuin, we landed 30 trout which weight ranged the 14-18 lbs. During the second day we landed 25 trout within 14 and 21 pounds. On the third day, we did the Collon Cura and we landed another 15 trout weighting between 14 and 16 lbs. The overall camping experience was fantastic and our guests left overwhelmed. The following day we went to the Huechulafquen lake with a boat and a raft. The day was clouded and then it started to rain. We landed 8 trout between 18 and 21 lbs and a beautiful big Brown trout of 24 pounds. Last week began with good weather, followed by warm easterly winds that temporarily soured fishing in the river. Our local trophy lakes, on the other hand, proved to be a productive Plan B—especially when we were able to find shelter from the guests. 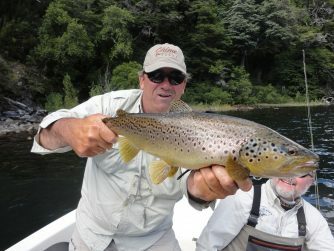 These stillwaters, such as the Tromen, Huechulafquen, Epulafquen, Verde, and Curruhe, hold impressive specimens and clients landed several browns and rainbows between 20 and 24 inches. Near the tail end of the week, the winds subsided and it was back to business as usual, floating a high Chimehuin. The river continues to fish great due to low angling pressure throughout the last month. Fishing season in northern Patagonia started in typical fashion, with weather changing from warm, sunny days to cold and windy. Water levels in the rivers were high due to big snowstorms in the Andes, which translated to heavy run-off and good streamer fishing. Dry fly action during the warm spells (blue wing olives and March browns) was also excellent. Overall, snow accumulation in the Andes has been a bonus, and will sustain cold and constant water flows through the hot summer months. Both our resident and migratory trout should benefit. 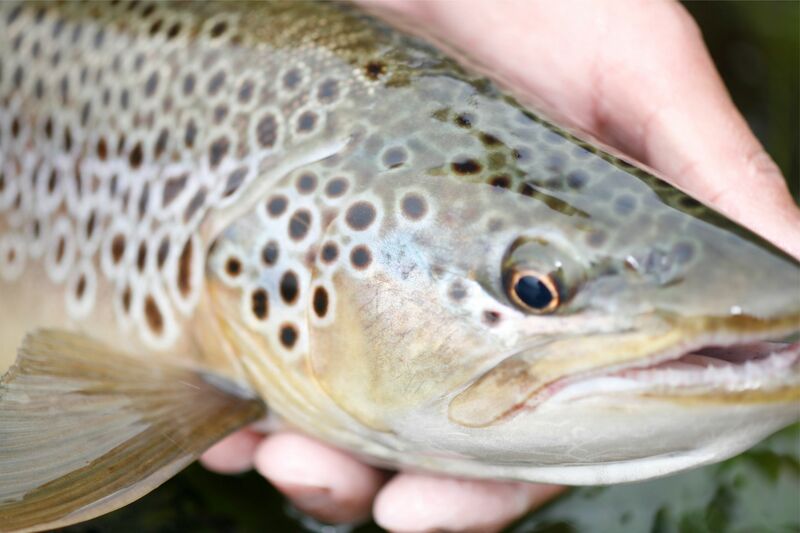 Currently all the rivers in the area, as per usual during this time of the year, are producing large brown trout. In addition, we’ve found tons of rainbows staging for the spawn, feeding like crazy to recover body fat. The upper and lower Chimehuin, Malleo, Collon Cura, and Alumine have been productive. 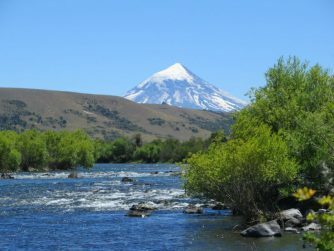 We should also name (but won’t, LOL) three tributaries of the previously mentioned rivers that offer incredible fishing for 12- to 24-inch trout, using 3- and 4-wt. rods and dry flies. We expect to have good water flows in these tribs through the end of the season. 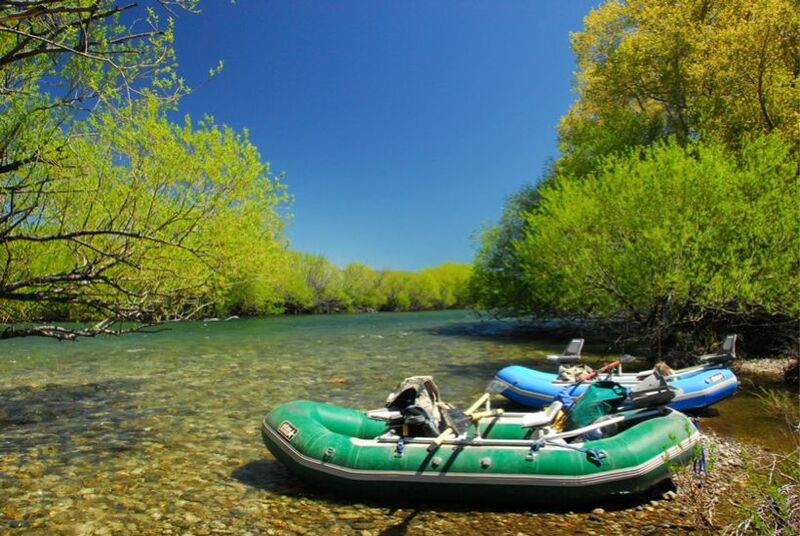 Ask your guides at Chime Lodge for more information on these spectacular waters. 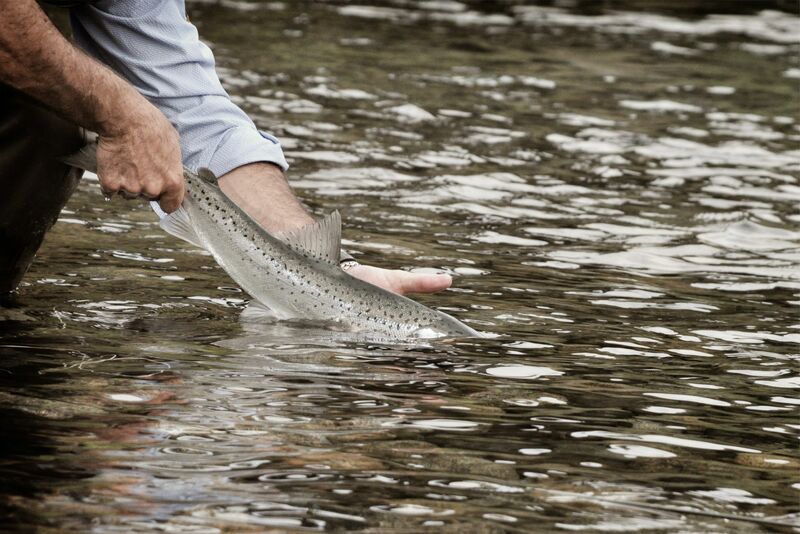 Lastly, the upper Chimehuin and its landlocked Atlantic salmon deserve special attention. These hard fighters love the higher and colder waters we’re experiencing right now. A white streamer will do the trick until the warm weather settles in. 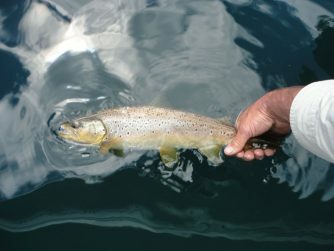 Once that occurs you’ll be able to catch them on dries or nymphs—all season long. 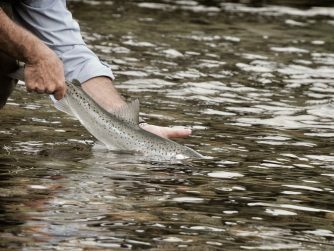 The season’s been off to a great start at Chime Lodge, with excellent water conditions across the Chimehuin, Alumine, Catan Lil, Collon Cura, and Malleo rivers. And so far guests have been blessed with both quantity and quality fishing—including a 27-inch rainbow recently landed on the lower Chimehuin. January was hotter than average and February got off to a tumultuous start, with storms and rain. 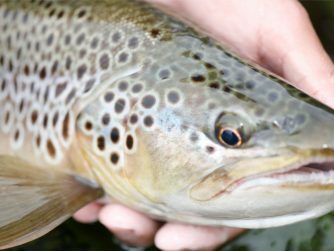 The not-so-nice weather, however, proved to be a bonus, cooling the water, increasing trout activity, and providing nice browns on the upper Chimehuin, near the lodge.